Or, finally she posts a picture or two! 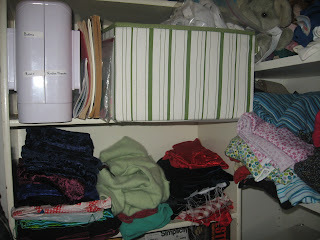 I'll admit it--my fabric storage is a mess. In theory, it's organized, but in practice, it's sort of shoved into boxes. I have my fabric separated into four categories. One is wovens suitable for clothes, one is knits, one is quilting cottons, and one is "fancy" fabrics--velvet, lace, and so on. Yes, it's a cardboard box. Actually, it's my serger's box! Since I took this picture, I have improved things a little bit. My dressmaker's dummy no longer lives on top of the box. However, I still have everything jammed in the box where I can't see it. 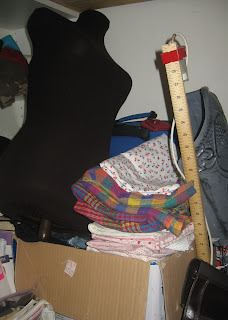 (This is not quite as bad as it sounds, and a future post on how I keep track of what fabric I have will explain why.) And yes, it's ugly and impractical. Here you can see my fancy fabrics, which are the three piles on the left, and my knits, which is the one small pile on the right (with the blue striped fabric on top). This may have to be changed, as I bought 7 more yards of thickish knits (which I still have to photograph and blog about) a few days ago. The striped box on the shelf above is full of my serger cones. And some spare elastic. This is the box I keep my quilting cottons in. 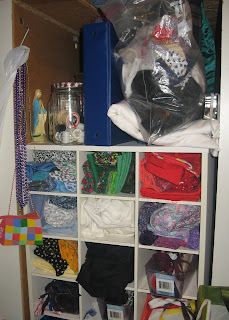 I actually like this storage idea. This is a shoe rack that my mother didn't want. The cottons are roughly sorted by color, and I have some notions in there too, in those purple boxes. I have a jar of empty spools and a jar of buttons there too, as well as a bag of scraps and my sister's knitting needle binder. And my other sister's Mardi Gras beads. So yes, this is a mess. It's not that well organized, and it really really unattractive. However, I have two severely limiting factors. One is money. The shelves I have are the shelves I've got to work with. The other is space. I forget if I have posted a picture of my bedroom/sewing room, but it is small. Think college dorm room size. I simple haven't room for another shelf or some super-organizer. That said, if anyone has any ideas, send them my way! These disheveled piles of fabric (because honestly, that's what these are) are starting to weigh down on me. I have an excuse this time! Where have all the sleeves gone?